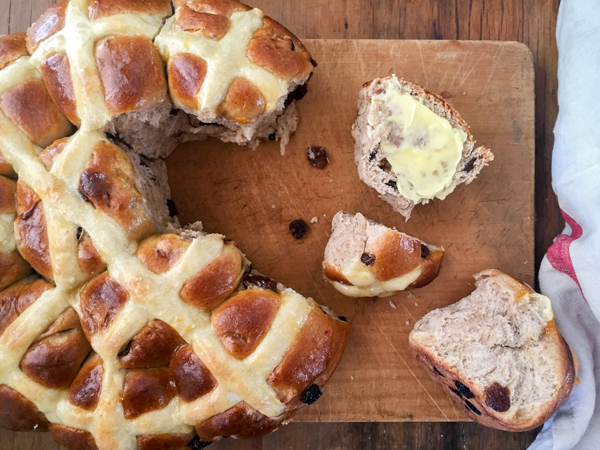 These light, yeasted hot cross buns are immensely satisfying to make at home. The recipe is a Donna Hay classic, though I used strong bread flour for extra fluffiness and baked them in a cast iron pot, as they fit snugly and rose really well all tucked in there. How cute are they! Apricot jam for the glaze and presto … fabulous homemade hot cross buns! Get the yeast going first. Gently warm the milk, then combine yeast, 2 teaspoons from the 1/2 C sugar and the lukewarm milk in a bowl. Set aside for 5 minutes to allow the mixture to bubble and foam. In a large mixing bowl, combine the remaining ingredients, and stir in the yeast mixture to form a sticky dough. When it comes together, turn out on to a lightly floured surface and knead the dough until it feels relaxed and elastic – about 8 minutes should do it. Place in a lightly oiled (and warm) bowl, cover with a clean, damp cloth and leave to rise in a warm spot for an hour or until it doubles in size. Turn out on the bench again and slice the dough into 12 even pieces. Gently roll each into a ball and arrange snugly on a lightly greased and lined cake tin (22cm square) or equivalent oven proof dish. Cover again and leave to rise in a warm spot for about 30 minutes. Preheat the oven to 200ºC. For the piping, mix the extra 1/2 cup of flour with 1/3 cup water and place in a piping bag or a plastic bag with one corner snipped off at the point. Pipe the crosses over the buns, then bake for 30-35 minutes. They should be golden and springy to touch, coming away from the edges of the tin. To glaze, warm a few spoons of jam with a little dash of water, and brush this glaze over the top while the buns are still hot. Enjoy with lashings of good butter and a hot cuppa. *mixed spice is a bought blend of mostly cinnamon, with allspice and nutmeg. Use this if you have it – but even better would be to replace with a good pinch of allspice (about 1/2 tsp), a few grates of fresh nutmeg (about 1/2 tsp, fresh nutmeg is in a different league and well worth having) and increase the ground cinnamon to 3 tsp. A pinch of ground cardamon wouldn’t go astray either.